Producing high quality medical technology with a focus on aspirators, ASSKEA GmbH of Gebesee, Germany relies on Smart Products' pressure relief valves in their procuff® M, procuff® S, prowound® M, and prowound® S products. The procuff® aspirators are designed to remove secretions in the subglottic area, which is a part of the airway located directly below the vocal chords. 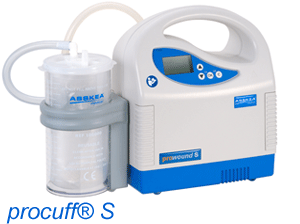 The prowound® aspirators are devices used for modern wound care or Negative Pressure Wound Therapy (NPWT). Both are available as a mobile "M" or stationary "S" unit. All units use air to suction out unwanted bodily fluids in the treatment of patients. Our own Model #122 is used as a relief valve to ensure pressure in the system cannot drop when the pump is in off mode (pictured installed). ASSKEA GmbH aspirators are used in the USA, Australia, Brazil, Russia, Germany, and Arabic Countries. Medical professionals and patients worldwide depend on these products within hospital and home care settings. Since ASSKEA's founding, the production and distribution of high quality medical equipment has been its business. The current generation of devices in the "S" and "M" series represents high efficiency with comfort and ease of use. The high technical standard and careful manufacture of these devices is the guarantee of their safety in use (source: http://www.asskea.de/index.php). The successful use of medical devices is essential to the effective treatment of patients. 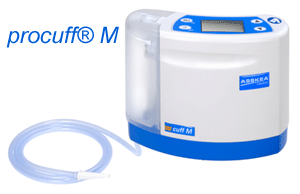 And, Smart Products has a vast amount of experience within this industry to help guide medical manufacturers like ASSKEA for their flow control needs.